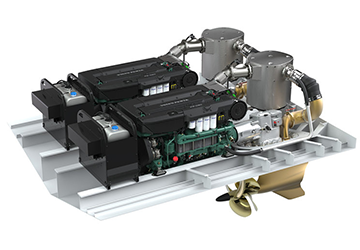 At the end of May, Pacific Power Group’s marine power systems partner Volvo Penta announced a new engine and aftertreatment concept to comply with new IMO Tier III standards. The solution is based on the company’s own experience, along with expertise from the Volvo Group, in selective catalytic reduction (SCR) technology. The resulting system is dedicated to heavy-duty marine operations. The new emissions restrictions, issued by the International Maritime Organization (IMO), were introduced in 2008 with a delayed adoption schedule, and will affect vessels entering the Baltic Sea and North Sea starting in 2021. The IMO is an agency of the United Nations which has been formed to promote maritime safety and clean oceans. Tier III regulation will stipulate a reduction in nitrogen oxides (NOx) emitted of around 70 percent, depending on engine size, when compared to current IMO Tier II levels. It follows the NOx designation by IMO already in effect for North American and Caribbean regions, and applies to most engines with an output of over 130Kw. The IMO Tier III solution will have undergone 20,000 hours of field testing when it is launched in 2018. The engine has been developed to sustain high back pressure while also maintaining efficiency and drivability, and will have the same footprint as current models. The exhaust aftertreatment system works with both Volvo Penta’s Electronic Vessel Control (EVC) and Marine Commercial Control (MCC) systems. Applications impacted by the IMO III system in North America will primarily be boats intended for Canadian operation. Pacific Power Group anticipates providing Volvo Penta auxiliary engines and generators for cargo barges requiring IMO III emissions due to transits between the US and Canada. Aluminum boat builders in the Pacific Northwest are also building boats for oil spill response in or around Canadian waters that also require the new emissions standards. Eventually, the PPG Marine Division also anticipates Canadian pleasure vessels needing or desiring IMO III emissions. The combination of Volvo Penta’s IPS package for IMO Tier III with the use of HVO offers another step forward in terms of sustainability. And, Pacific Power Group will available to help navigate the new standards, engine, and upgrades for your new and existing marine systems.